On Monday, Michael McNamara made a well-reasoned case for the Pelicans to pay whatever price it would cost in order to bring Paul George to New Orleans next season. He makes this suggestion despite knowing that there is a reasonably high chance that George still leaves when his contract expires next summer. The appeal of adding a star player in his prime at the Pelicans’ biggest position of need is obvious. Slotting George into a lineup with Anthony Davis, DeMarcus Cousins, and likely Jrue Holiday would make the roster one of the top three most talented groups in the NBA. Oh, and none of those four players are older than 27. Unfortunately, George’s contract expires in a year. Not only that, but his representation has made it clear to the entire league that he wants to play for the Lakers, and any other team that aims to acquire him would only be doing so for one season. Does this declaration mean that he will undoubtedly be in Los Angeles next season? Absolutely not – as McNamara noted, there are no certainties, and so much can happen in over the span of twelve months in the NBA. Superstar caliber players rarely become attainable, and even less seldom are the opportunities to pair such a player with two other elite talents. That said, the most likely scenario based on all available information is Paul George joining the Lakers no later than next summer. There should be no disagreement about whether or not New Orleans should make an offer for George, but is “whatever it takes” too much? Ultimately, this dilemma comes back to one of the most polarizing debates professional sports: what distinguishes success from failure? Is winning a championship the only way to satisfy a franchise and its fan base, with routine early (or even late) playoff exits deemed insufficient? Or should a team’s goal be to assemble a consistently competitive team that may one day have an opportunity to win a title, even if it never gets there? If George re-signs next summer, then this gigantic package is more than tolerable. George staying in NOLA would indicate that the long-term prospects for the Pelicans is especially bright, making it equally likely that Cousins would re-sign as well. That would presumably put all Pelicans first round draft picks between 2018 and 2020 in the 20-30 range (or 50-60 for the second round picks). After that, Anthony Davis could opt out of his contract (assuming he had not signed a Designated Player Extension by this point), but even if he decided to leave George and Cousins behind, those two would still likely be good enough by themselves to keep New Orleans in the playoff picture. So, not only is the team completely devoid of future draft picks, but it is basically capped out for the 2018-19 season with a disaster of a roster beyond AD, Cousins, and Jrue. Even in 2019-20, Davis-Cousins-Holiday-Hill alone gets the Pelicans close enough to the cap that the team would have no room to add any meaningful talent. And then, all of a sudden, Davis is an unrestricted free agent. Realistically speaking, the only good reason for him to stay with New Orleans at that point would be the DPE, which would pay him far more money than if he were to sign with a different team. And we haven’t even gotten to the worst case scenario yet! Now, for that worst-case scenario – what would happen if Cousins sees the writing on the wall from the above scenario and decides to follow George out of the door next summer? Had the Pelicans not traded for George in the first place, a mere playoff berth may have been enough to convince him to sign a max contract extension. After playing with George for a season and then seeing him leave, skepticism could set in regarding how good the team can actually be. Should this chain of events occur, Anthony Davis is probably as good as gone when he can opt out in 2020. Therefore, the Pelicans’ best move may be to trade him as early as next summer in order to receive maximum value in return. Unfortunately, the rebuilding process would be immensely difficult thanks to all of the (now supremely valuable) draft picks and pick swap options that belong to the Pacers. Even with all of the scenarios above, you may still say that it’s a worthwhile gamble to make. Unfortunately, the Pelicans play in the New Orleans market, which is not exactly the most promising one from a pro basketball perspective. The New Orleans fan base does a pretty good job supporting basketball when the team is performing well. When the team is bad, though, that can change quickly – and that is WITH young franchise players like Chris Paul and Anthony Davis. What would happen to attendance and overall support of the franchise if the team lost its transcendent talent and had no clear path to significant improvement (draft picks) in a market that routinely struggles to attract top free agent talent? The Pelicans have a 90 year old owner and a lease agreement that expires in 2024. While the widespread expectation is that the franchise stays within the Benson family and is at no risk to move, that outcome is not a guarantee. 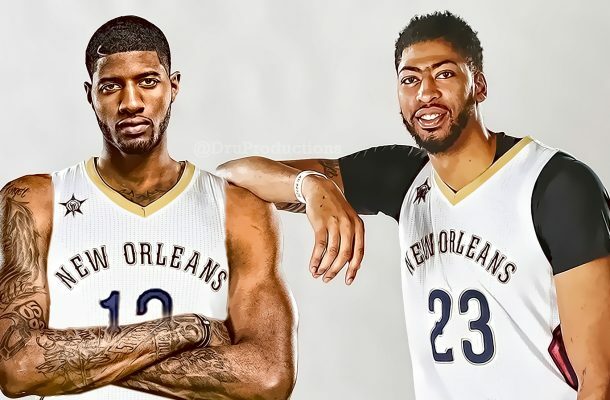 A year with Boogie, Brow, and (probably) Jrue could change Paul George’s mind about bolting for Los Angeles and create an incredible superstar core in New Orleans through each player’s prime that could conceivably threaten the Warriors as soon as next season. But there is also a real long-term risk that comes from an extended period of apathy or pessimism from the New Orleans fan base due to the deterioration of a team with no talent and no draft picks. If we’re going to harp on the best case scenario, we need to think about the worst case scenario, too.